A NATIONAL NETWORK of churches, groups and individuals which support each other in carrying out their Christian ministry of witness and outreach. PROCLAIMING AND LIVING OUT the simple, powerful message of hospitality and love revealed by Jesus Christ. DIVERSE COMMUNITIES which are large and small; urban, suburban, rural; young and old; many races and cultures. This growing, grass roots movement is transforming the lives of countless individuals and communities. Since 1984, the Reconciling Congregation movement has grown to more than 861 Reconciling Congregations, Campus Ministries and Annual Conferences. It also encompasses over 34,000 Reconciling United Methodists who publicly witness to “open the doors” of the church to the participation of all people, regardless of sexual orientation or gender identity. JOIN US in this vital Christian movement that seeks to fulfill the Biblical teaching that we are to LOVE God and our neighbor as ourselves and to do JUSTICE. After more than 40 years of ongoing debate at each of the General Conference meetings of the UMC, once again in 2019 at a Special Session of the General Conference the denomination failed to remove the harmful language and restrictions with respect to LGBTQ persons and instead passed more restrictive legislation. Some or all of that legislation may be found to be unconstitutional by the Judicial Council of the UMC later this year. So our work continues to warm hearts and open minds. We stand ready to assist local churches to determine if they want to join us as advocates for change within the institution and become Reconciling Congregations. We will reach out in mission to members of the LGBTQ community to welcome them to our churches and to affirm them as children of God. It is with a heavy heart that we share the news that the Minnesota Reconciling Congregations recently lost one of its long time advocates for change and inclusion. The Reverend Jeanne Audrey Powers, a queer saint, is now part of the great cloud of witnesses cheering us on to finish the race for LGBTQ justice. She passed away in her sleep in Switzerland while with her family and friends. One of the first women ordained in the Methodist Church in 1958, she came out as a lesbian in 1995 in her famous sermon “The Journey” (shown in this video) at the Fourth National Convocation at Augsburg College in Minneapolis. Read more about the legacy of this courageous woman at http://bit.ly/1RYBedt #TBT. 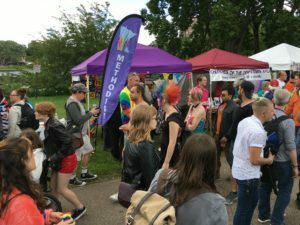 Twin Cities Pride is one of the largest Pride Celebrations in the United States. It represents a phenomenal outreach opportunity by our Minnesota Reconciling Congregations to show their support for the LGBTQ community. 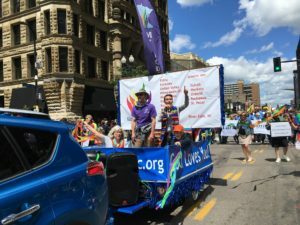 With a festival booth in Loring Park and our parade unit, we share God’s love for all. We seek the removal of all hurtful language in the UMC Book of Discipline that is directed at homosexuals and the LGBTQ community. In a call for Biblical Obedience, we support an Altar for All to allow UMC Clergy to perform marriages to any prepared couple. We support the ordination and service of LGBTQ individuals who are called to ministry within the UMC. The Reconciling Ministries Network and the Minnesota Reconciling Congregations provide support and materials that you need to help your Church become a Reconciling Congregation. We need a representative to represent your local Church in this group. A leadership team meeting is held every other month.